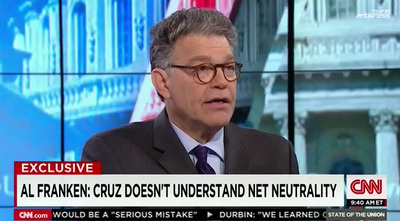 On Sunday, Minnesota Senator Al Franken appeared on CNN’s “State Of The Union” with Candy Crowley and launched into a ripping critique of Texas Senator Ted Cruz’s net neutrality position, basically saying that Cruz doesn’t understand the issue at all. Following President Obama’s November 10 statement urging the FCC to enforce regulations to protect net neutrality, Senator Cruz wrote a strong-minded opinion in the Washington Post. “In short, net neutrality is Obamacare for the Internet. It would put the government in charge of determining Internet pricing, terms of service and what types of products and services can be delivered, leading to fewer choices, fewer opportunities and higher prices,” Cruz said in the Washington Post.